The Cornerstone Research team has grown to 148 competition economists, spread across eight offices in the US and Europe, and added two new principals to its European practice – Maria Maher and Vivek Mani in London – in late 2017. However, it also saw some departures and other changes in personnel in the past year. Boaz Moselle rejoined Compass Lexecon as an executive vice president in London, bringing with him Luis Agosti and Ruxandra Ciupagea; the rival consultancy also snagged Shankar Iyer as an executive vice president in Washington, DC and New York. Andrea Shepard, who had been the co-head of Cornerstone’s competition practice and a senior vice president, has downshifted to the role of senior adviser. Now Bryan Ricchetti in Chicago co-heads the team with New York-based Rahul Guha; Peter Davis leads the practice in Europe. 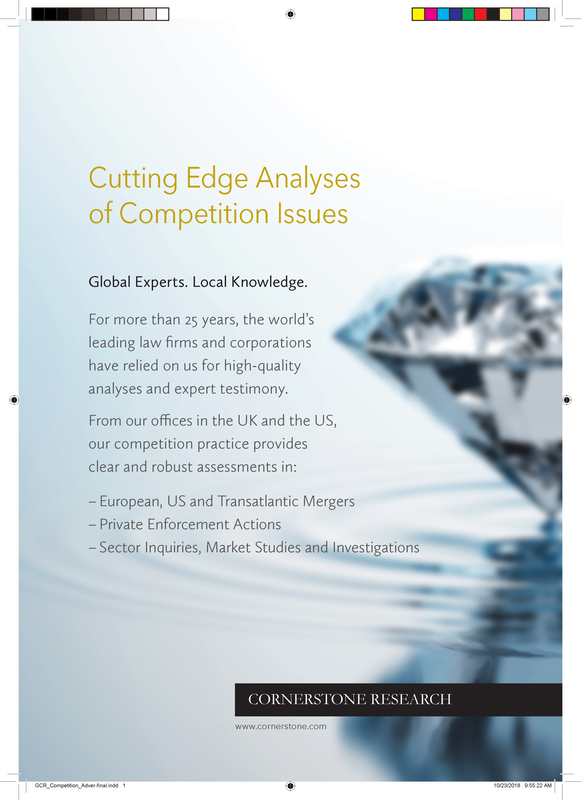 Between the end of 2017 and the start of 2018, Cornerstone Research advised clients on competition and regulatory issues in 21 mergers in Europe, Asia and the US. Its affiliated experts testified in three merger-related trials — two on behalf of the merging companies and one for the authority. The US FTC retained Cornerstone Research and Aviv Nevo in its challenge to the proposed $400 million merger of Wilhelm Wilhelmsen and Drew Marine. Nevo testified during trial on the relevant antitrust market, the likely competitive effect of the merger, and barriers to entry. A federal judge granted the FTC’s motion for preliminary injunction and the companies abandoned the deal in 2018. In another US case, Sanford Health and Mid Dakota Clinic retained Cornerstone to defend their potential tie-up; Robert Town testified about the potential competitive effects of the proposed acquisition. The trial judge blocked the deal, but the healthcare providers have appealed. The firm has deep expertise in litigation and regulatory inquiries. Peter Davis wrote an expert report and testified in front of the UK’s Financial Conduct Authority’s case decision group, in the authority’s first issuance of a statement of objections; it charged four London-based assets management firms for illegally sharing information before multiple initial public offerings. Cornerstone has supported economic experts in multiple litigations regarding financial benchmarks such as the London InterBank Offered Rate, foreign exchange derivatives and US treasuries. The firm is also active on the intersection between antitrust and intellectual property and is involved in several standard-essential patent matters and the use of injunctions as a remedy.